Adds a new armor set for male and female and adds 2 swords. Thanks to Billyro for letting me upload this port to SSE. PSA: After a long break, I have decided to return to Skyrim SE, and this in no way, 100% irrefutably, absolutely, please believe me has nothing to do with the fact that SKSE64 is in Alpha now. Definitely not. Anyways, I'm going to attempt to port this to the Xbox One, but I do not own one myself. If anyone would like to "beta test" it for me, please shoot me a message. Thanks. This is a port from the original mod found here. This is reuploaded with permission from Billyro. Thanks to Billyro! None of the assets used in this mod are my own. I simply ported it over. 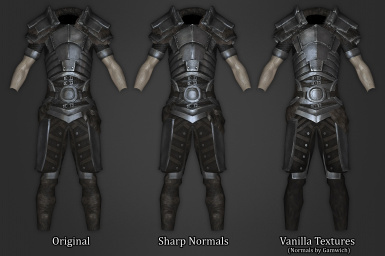 This mod adds two new swords and a new armour set for male and females. There is full weight-slider support and the armour should be compatible with all body mods. The equipment is similar to ebony in stats. You can temper and enchant all items. also have more shape. Get this if you like grittiness over smoothness. together better - so the upper and lower body have less differences. will appear that way in-game. might be some overlapping objects and such, but it shouldn't be too bad. I have cleaned the mod with TES5EDIT. download with NMM and activate it through that. doesn't have any adverse effect in-game and can be ignored. There is minor clipping at the wrists. Just wear the gauntlets and you'll never notice. Beast races are currently not supported. Sorry. texture artists that I've given credit to). Humus, for his cubemap bases (from which I edited and generated the cubemaps). Nobiax, for his chainmail and iron texture overlays. CaBaL120, for his aMidianBorn textures that I used as a base. XRC (Exray Catt), for his Imperial heavy boots texture which I used as a base. Gamwich, for generating the normal maps for the vanilla version. 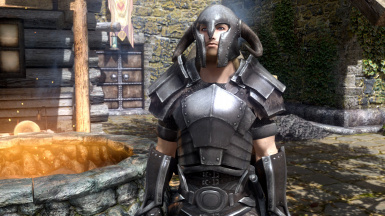 Destero, for creating a full-helmet addon based on the Dawnguard helmet. Jaykin1, Liemertha, and Zjamz for atmospheric screenshots. Don't know how to proceed at the Wanderer's Monument? Follow the direction the Eagle statue is pointing. You'll find other statues - keep following them until you reach the end. The final statue has a small pedestal with a key on it. Take this key back to the Wanderer's Monument and open the strongbox. 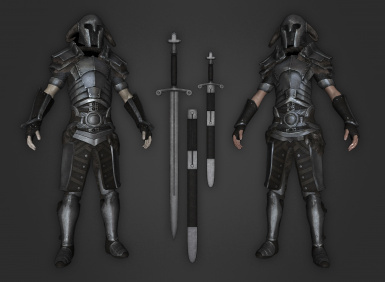 What materials do I need to craft the armor/weapons? The crafting manual has a list of all the materials you need for each piece. Alternatively, you can find the item code by typing 'help "nordic wanderer" 0' and using the additem command.